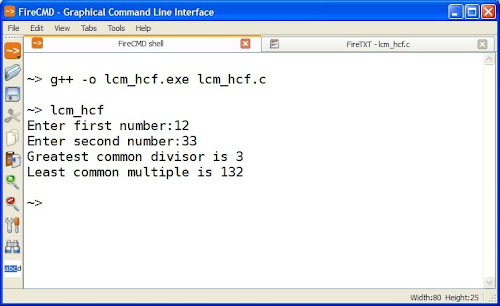 This is a program code to compute LCM (Least Common Multiple) and HCF (Highest Common Factor) of two numbers entered by user in C programming language. Note that LCM is also called lowest common multiple or smallest common multiple and HCF is also called greatest common divisor (GCD) or greatest common factor (GCF). Note: As shown in the image above, you can compile the program using FireCMD shell.